This past weekend we celebrated D’s and his mom’s birthday. Celebrations started on Friday and ended on Sunday, visiting with all sides of the family. I think he had a nice time. I asked him what he wanted to do and we did it. When I asked him what he wanted to do on his actual birthday, he told me he wanted me to make Italian Beef (simple) and maybe a dessert or something that Mini Me could also have. After all, we don’t need a crazy 3 year old to be going on a jealous rage that she can’t eat cake when we are enjoying it. So, Thursday night came, and Mini Me and I started making a cake. She absolutely LOVES to help me in the kitchen. Loves to help measure things, mix things, and just be with me. I am flattered by it. 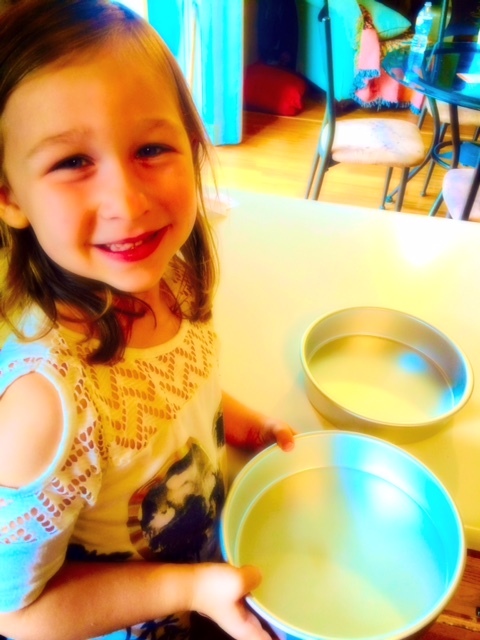 And because I was making a Vegan/Allergy Friendly cake, she got to taste every ingredient along the way. I may have, too. We first made the cake. While it was baking, we moved onto the mousse, and then the ganache. Once the cake was cooled completely, I spread the mousse between the two layers of cake, and added a thick layer to just the top of the cake. I let that set overnight in the fridge (in this awesome Wilton Cake Caddy) while the ganache also set. 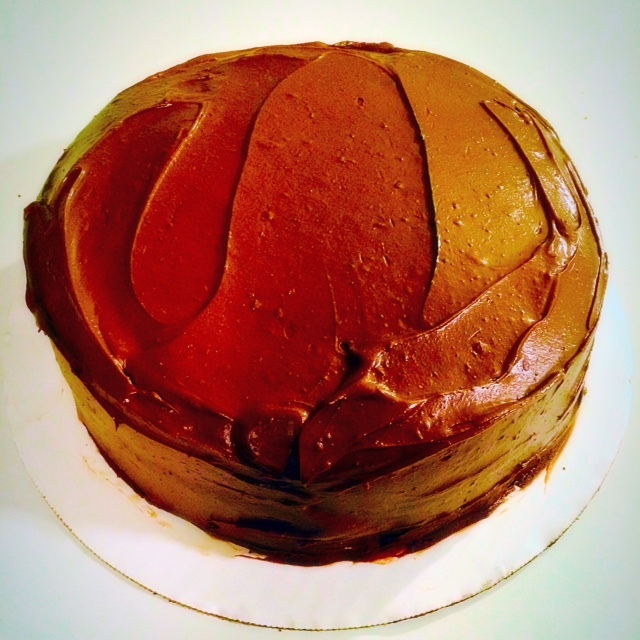 Before the birthday boy got home from work, I spread the ganache evenly on the top of the cake and the sides with a large icing spatula (like this one), and put it back in the fridge until it was time to serve. Please remember, if you do make this cake, that it needs to be refrigerated for the mousse and the ganache. Don’t worry, it won’t dry the cake out, I PROMISE! Let me tell you… This cake is ABSOLUTELY amazing, and you would have NO idea that it was vegan. None. I wanted to eat the whole thing. I likely had too much of it over the weekend… Just sayin’. I might as well own up to my indulgence. It was totally worth it, though! Put all ingredients into a blender (I used my single serving Ninja cup) or food processor and blend until smooth. With a double boiler or a sauce pot with water topped with a glass mixing bowl, melt and combine all ingredients together until smooth. I whisked along the way with a small whisk to be sure that it was completely smooth. Let set for at least 3 hours in the fridge before using as an icing. Enjoy this super fudgey cake! It is my favorite cake I’ve actually ever had – saying a lot considering where I work! You are on a diet? One of my most despised words is “diet” or “dieting”. Why? Because it means you are depriving yourself of something. You are making it about not being able to get what you want. Start off front-loading your calories. This will keep your energy levels up throughout the day, and eliminate making your night time meal (your most inactive time of day) your largest. Don’t deprive yourself of something. If you want to have something, have a little bit of it. If you have more than a little bit, ok. Just remind yourself that next time you will do better and have just a few bites. You won’t always be losing. Sometimes you might gain, sometimes you might maintain. It all happens with a typical weight loss journey and healthy lifestyle change. Exercise. Find something you like and do it. Don’t force yourself to do something that you don’t like or you will find yourself making excuses not to do it. Instead, pick up an old hobby, find a sport to play, or experiment with different types of exercises to find what works for you. If you want to workout at home, great! Beachbody programs are awesome for a variety (especially if you do the On Demand that was recently launched). If you like to play baseball, find a league. If you hate running, don’t do it. Just do what works for you. Try not to compare yourself to others. Sure you might have a goal physique, but try not to look around you and compare yourself to other people you see who seem to be perfect. Remember, they most likely work just as hard for how they look as you are working. Keep that light at the end of the tunnel. There are days that I just want to quit because I feel I will never get to where I want to be. The truth is, that you will never be able to stop what you are doing if you want to maintain the healthy life. You will need to continue to work and eat right, which is why it is important to remember #4. Surround yourself with like-minded people. 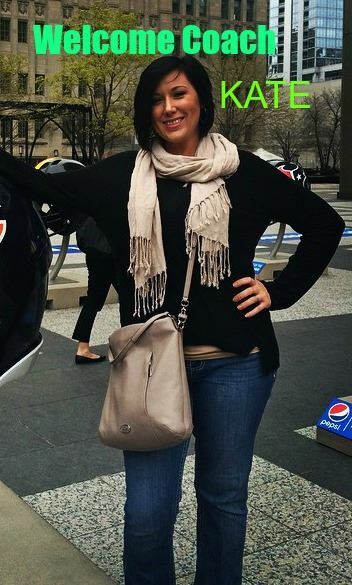 These people can come in many forms – meeting new friends on a sports league, finding that a colleague has the same goals, meeting people from a gym, chatting up a neighbor, and even finding true friendship with people on fitness websites like myfitnesspal.com or bodybuilding.com. You will have moments that you want to quit or need advice. These individuals will help you. Never be afraid to try something new and challenge yourself. Try that new recipe. Take a run thru the mud and climb walls. You might find something new that you really enjoy. Eat protein and fats. Changing your lifestyle isn’t about eating just vegetables and fruit, rice cakes, and low fat foods. Eat that beef. Have that egg. Eat that cheese. Get these healthy fats and proteins into your diet – you will feel like you are more satisfied and full than if you just ate “diet” foods. Changing your lifestyle isn’t expensive. So many times I hear people around me complain that buying healthy foods is so expensive. Think about it… How much do you spend on take out? How much do you spend on bags of chips? I usually spend about $30 per person for a week of home cooked meals (all meals). If I had more time and was able to make some of the things my family enjoys from scratch – like protein bars, healthy muffins, and fruit salads – it would be even less. Water. This is one that I consistently struggle with. Its not that I am drinking other liquids, but merely get so wrapped up in what I am doing that I forget to drink it. The USDA standard is 8 cups of water a day. Honestly, this isn’t really enough for most adults, especially if you are exercising. The rule of thumb that I have consistently heard is 0.5-1 ounce of water for every pound that you weigh. It seems like a lot, but you will find that your body starts to crave it if you aren’t drinking enough. Ladies – don’t be afraid to lift weights! I’ve heard numerous girl friends who are cardio bunnies (or don’t even workout) say that they don’t want to get bigger by lifting weights. I could slam my head against a wall. I wish I could show them the picture of 1lb of fat vs 1lb of muscle and have them see how that isn’t true. You will not get larger, you will get thinner and have a better shape. Not all women are bikini models and fitness competitors, but if you want to get rid of your love handles and your thunder thighs… Weights are the way to go, especially when combined with some cardio. Eat often. Make sure you don’t let yourself get too hungry. Learn to recognize the signs of your hunger. I usually eat about 5-6 times a day. It is almost a running joke around the office that people always see me with food. So what… let them laugh. I know that my body functions best like this. Weigh, measure, and log. Get a cheap scale from the store or from Amazon.com. I’m sure you already have measuring cups. You do this, and you are forced to be honest with how much you eat. Eat the right amount of calories. Whether you are just starting out and going with what a fitness site like myfitnesspal.com tells you to do, or you are more involved and eat to your macros (check out this calculator at Scooby’s Workshop), be sure that you are eating enough. I’ve followed numerous programs that have had me on an extremely restrictive calorie count and I can tell you that it never lasts long. I give up, and end up eating way more than I should or “sneak” things into my day just so I can feel satisfied. Sleep! Getting the right amount of sleep is imperative for your body to be able to function properly. Most adults need between 6-8 hours of sleep a night. If you feel like you are always waking up tired, go to bed around 30 minutes earlier or get up 30 minutes earlier. You are most likely waking up in the middle of a REM/deep sleep cycle and your body will feel more tired than usual. Adjusting your sleep will help you wake up when your body is in a light sleep cycle and you will feel well rested. Set Goals. I’m not just talking about the end goal, because…DUH… We all have them. Set mini goals. Whether it is to be able to fit into that dress that is a size smaller, or to stick to your workout program for a week (sometimes that’s a huge win). Set them. Reward yourself or pat yourself on the back when you do. Brag about it. If other people around you are truly supportive they will be happy and proud of you. Be proud of yourself. Seriously! Be proud of yourself – you’ve made the decision to get healthy, not just diet. That is a huge step. You are in this for the long haul. Smile, and be proud of yourself. Being healthy isn’t just about dieting, it’s about changing your life. If you are interested in learning more about some of the programs I have done or some of the nutrition that has worked for me, please let me know! I would love to help you on your journey. No, Mommy… You can’t go run. I want pancakes. Sunday morning. The first morning in a week that the temperatures have been over 20 degrees. This means… RUNNING!!! I’ve been waiting for this morning for a week. The arctic temps here in Chi town have been insane. Time for them to move on and make someone else miserable (sorry if you are that someone else). Going to bed last night, I triple checked to be sure I had my alarm set so that I could wake up and get a run in around 7am. I wasn’t planning a long run, just a quick 30 minutes out getting some fresh air, shoes to the pavement, enjoying the “me” time. Alarm went off, I got up, slowly started getting myself to wake up enough for my brain to tell my feet to move one in front of the other, and suddenly I hear…”MOOOOOMMMMMMMYYYYYYY!!!!! MOMMMMMMMYYYYYYYYYYY!! !” coming from the room next to mine. Mini Me was awake. I suppose I can’t really complain when she sleeps 12 hours, but darn it… I wanted to be out the door when she woke up. I go in, give her wake-up snuggles, and asks if she wants to hang out with me while I finish getting dressed for my run. She looks at me all innocent and says, “No, Mommy. You can’t go run. I want pancakes.” I explained to her that she can get up, have some milk and a banana while I was running and when I got back I would make her pancakes. Told her I would be gone for 45 minutes, max. She seemed ok with this rationale. I finished getting dressed, getting my new ear buds in (thanks to my bro-in-law) and my runner’s pepper spray (thanks to D and mom-in-law… we have coyotes around here), and get to moving. Finished my run at a pretty good pace, and entered the kitchen, knowing that Mini Me was probably getting hangry at this time. 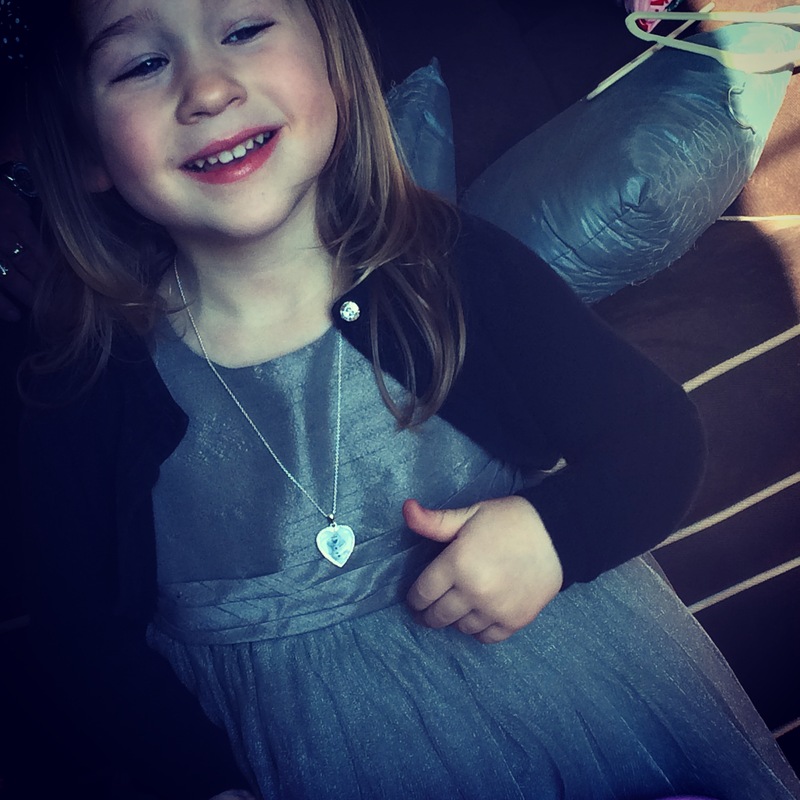 If you don’t already know this, a hangry three year old is no good. I am pretty sure that is how wars start. Enter… Pancakes. Now, as a quick reminder, Mini Me is allergic to eggs, milk, peanuts, fish, and shellfish. Baking is constantly difficult, and breakfast foods are one of the most difficult things to work around. But a few years back, I was lucky enough to stumble across a Banana Oatmeal Pancake recipe from the Colourful Palate. These have been a lifesaver for me! I did alter the recipe slightly from theirs, making them less gummy and a bit more toddler approved. 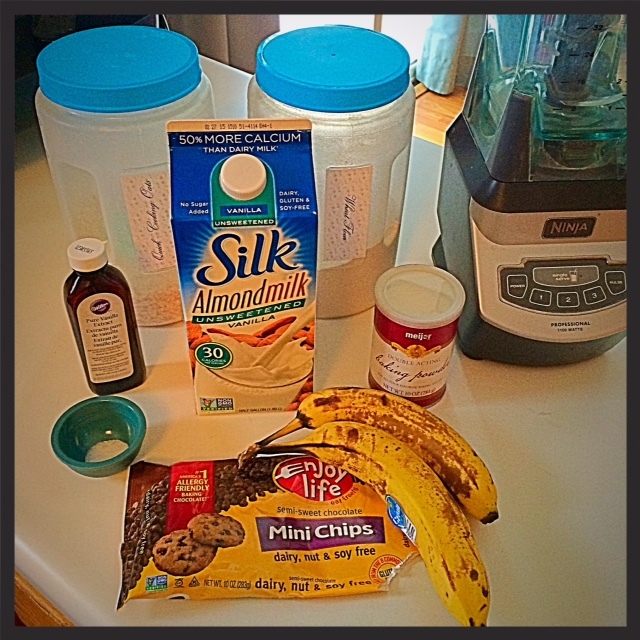 Blend all ingredients until combined, except bananas and chocolate chips. Add bananas and blend until smooth. 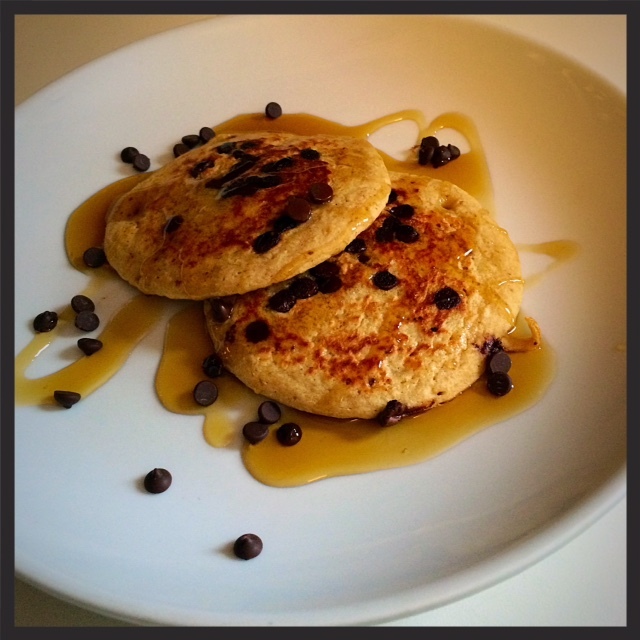 Pour batter onto a hot skillet or griddle prepared with spray or coconut oil (I use my electric skillet because I can fit more), and sprinkle chocolate chips onto the pancakes as desired. Wait until bubbles form in the center of the pancakes and flip to finish. Recipe will make around 12-15 medium sized pancakes. After all was said and done, Mini got her pancakes. BONUS – these refrigerate and reheat really well for quick grab and go breakfasts during the week! Brrrr…. This extreme winter weather is about killing me! Woke up this morning to -9 degrees with a feels-like temperature of -28. That’s in Fahrenheit to all my international, folks. Not even kidding. Right now, it is actually warmer in Antarctica than it is Chicago. It’s a nice 29 degrees Fahrenheit there. See ya later folks, I’m moving to Antarctica. Go home, Mother Nature… You’re Drunk. The temperatures are more than just cold, they are draining. I used to be able to get outside for a run in the mornings, but when it is this cold (anything lower than 15 degrees I don’t run outside) I don’t even bother – too dangerous for me. No outside run, means no fresh air, no Vitamin D, no energy. I’ve been supplementing with my ½ bottles of 5 hour energy pre-workouts, a nice little shot of espresso after my workouts, and a mug of coffee on the way into work. This is probably waaaaayyyy too much caffeine, but I’m dragging. Because I’m dragging, and it’s the first full week back to work, I wanted to have some easy meals to be able to fix for us. 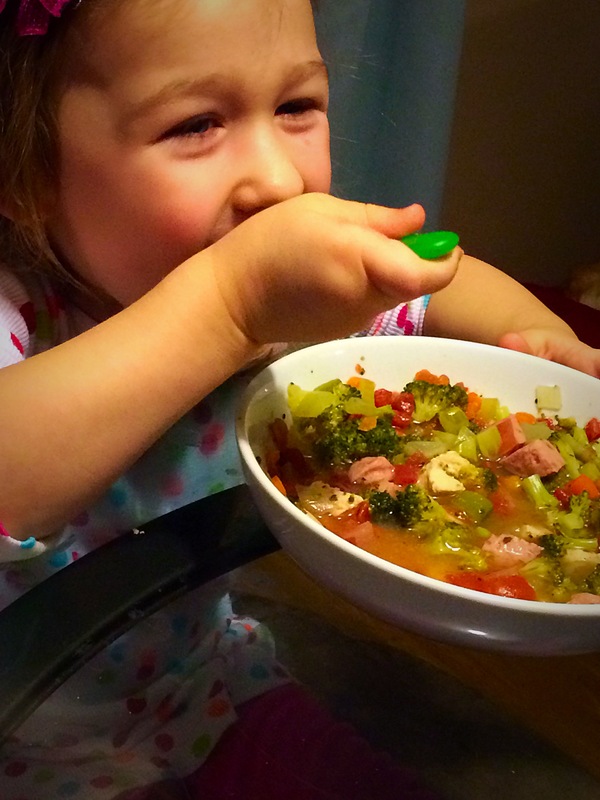 The GIANT batch of soup I made this weekend helped with warming me up throughout the week, and Mini Me loves eating soup, but sometimes you just want a little something different. Different, yet easy. 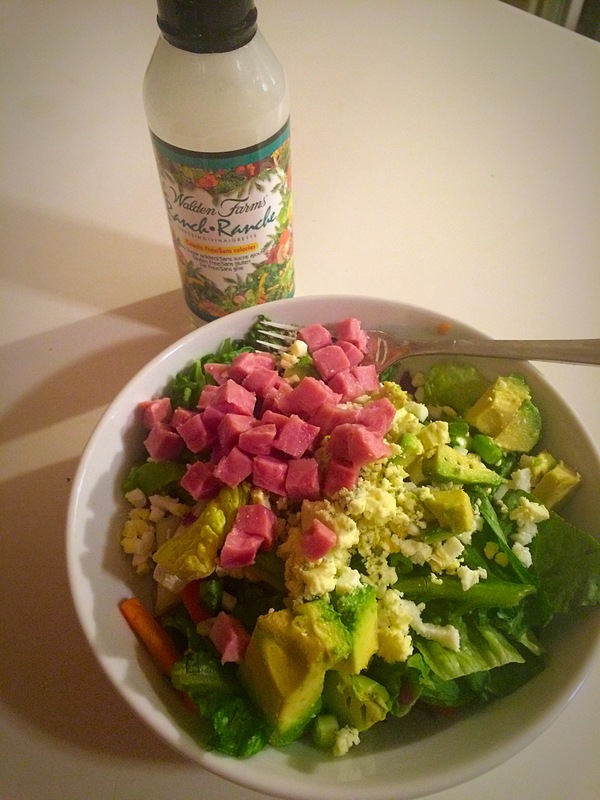 Enter cobb salad. To me, it feels a little more like summer when I eat salads. Don’t ask me why, but cheers me up a bit. I’m funny like that, I know. Feel free to add other ingredients for your tastes or macros! This took me about two minutes. I split the bag of lettuce between two bowls. I used a fancy egg masher (like the one in this little set – Multi Function Kitchen Tool) and easily mashed my eggs. Measured and crumbled my block of blue cheese (less expensive than the already crumbled cheese). Sliced my avocado and weighed it to be sure I was getting the right amounts. I was a little over, so I let Mini snack on some pieces – she loves it and I really can’t blame her. Weighed and split the ham between the two bowls (chicken would be a good addition for extra protein, too). Used my kitchen sheers to cut my green onion directly into the salad bowls. Measured and poured my dressing into the bowls. Viola! Yummy salad done and in a hurry. Sure – I could have done something fancy or taken the time to prep all of the ingredients myself, but if it’s healthy, yummy, and makes us all happy and think of summer (ok maybe that is just me), why not? After all the holiday celebrations were completed in our house, the question we kept hearing from Mini Me was “What’s after (fill in blank with a holiday)?” I would get her a calendar and explain to her when things happen, but (1) she can’t read, (2) she has no concept of time (nap time and night time are the same concept to her – she sleeps and wakes up), and (3) she will just forget anyway. Oh, to be a young child again. “What’s after Christmas?” Mini Me questions me one night while I’m making dinner. I open the fridge, faced with leftovers from various gatherings. Yes, indeed… What is after Christmas? A fridge full of leftovers and a puzzle of how to put them all together. One item is glaring me right in the face, taking up an entire shelf in and of itself – The Veggie Tray. Every one of my family’s gatherings has one, and every family gathering there is one left over. Too many other yummy things to feast on, I suppose. My cousin was gracious enough to let me take it home (thanks, Sarah! ), knowing that we eat fresh fruits and vegetables every day. But, the holidays came and went, and the ominous Veggie Tray was still taking up shelf space instead of space in our bellies. I decided that I was going to use that Veggie Tray once and for all, cleaning out additional fresh veggies from our produce drawer along the way! Challenge….. Accepted! Prepare all ingredients as listed. I chop all vegetables, then sausage, and finally chicken so that the raw food is the last thing to go on the cutting board. Even though it all gets cooked together in this meal, I’m pretty methodical on how it gets prepared. Heat the olive oil in a large soup pot over medium heat. 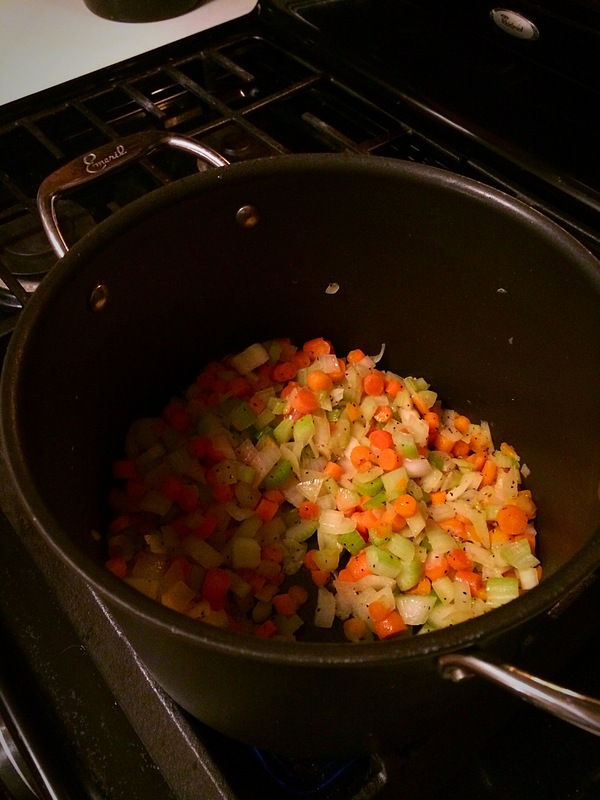 Add celery, carrots, onions, salt, and pepper. Saute until fragrant and onions are translucent. Add all remaining ingredients. Stir to combine. Cover and bring to a boil (about 5 minutes). 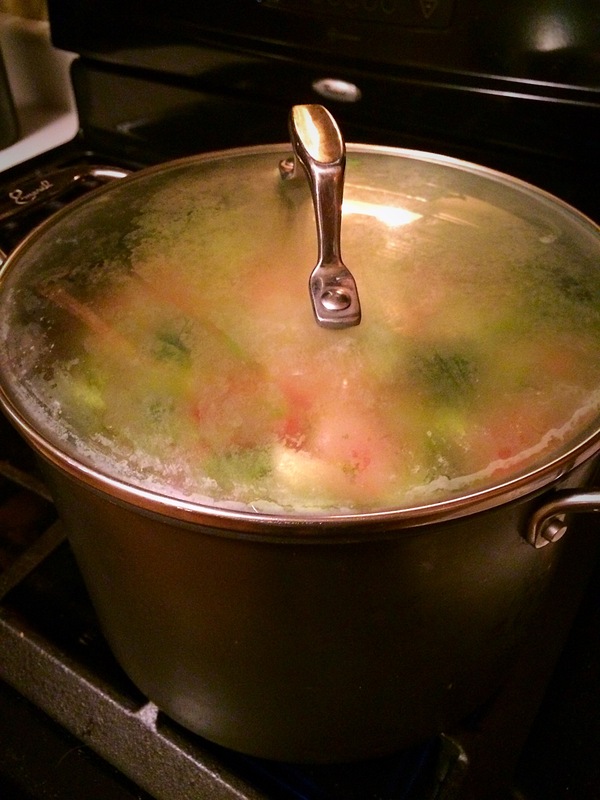 Reduce heat to low and simmer for 20-25 minutes. Makes 8 large servings (around 3 cups each). I think she is satisfied with what came after Christmas. Yesterday was a cold winter’s day in Chicago, and all was quiet… Except for the plows going by the house every 10 minutes starting at 3:45am, knocking over garbage cans, the garbage men coming through the neighborhood, and the insanity of a three year old little girl who loves chasing two little barking dogs (a 5lb Chihuahua named prince and a 7lb mini dachshund named Isabel). Ahhh… This is my life. While it is chaotic, I wouldn’t change it for the world. After deciding at 5am when my alarm went off (after listening to previously mentioned plows go past the house for a good hour) that I was not going to be able to get a morning run in, I rolled out of bed determined to do something with my day. I had HUGE plans. Plans that included cooking, cleaning, and having a dance party with mini me. Like I said… HUGE plans. 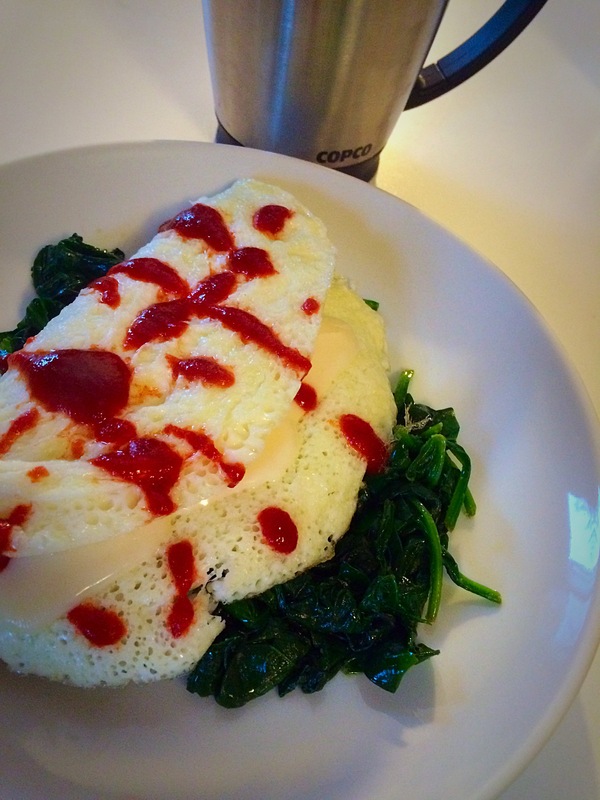 I downed a cup of coffee, made some breakfast (pictured below – sauteed spinach topped with egg whites, Babybel cheese, and sriracha), and started with my day. My cooking plans for the day included making a sweet potato hash, inspired by my mom’s farmhouse hash she had made for our Christmas celebrations with our family. It was the perfect addition to eggs. Don’t get me wrong – I love my eggs, but I was in search of something to make them more exciting. I knew that I wanted to add some more veggies (let’s be real – who has a hard time getting all their veggies in every day??) 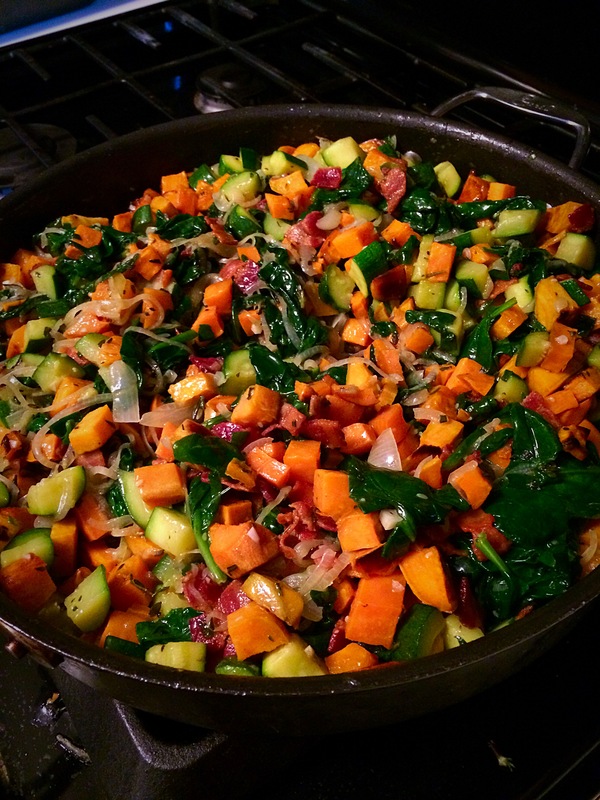 and use sweet potatoes (more nutrient dense than white potatoes). Peel and chop sweet potatoes into small cubes, toss with olive oil and roast at 425 for 25 minutes, flipping once in the middle of baking. While potatoes are baking, chop onions and zucchini into small cubes; mince garlic, and chop rosemary. Chop Bacon into small pieces. Saute bacon in a large skillet until crispy. Remove from pan leaving the bacon grease for sauteing vegetables. Add onions, garlic, rosemary, thyme, salt, and crushed red pepper flakes. Cook until fragrant (about 1-2 minutes). Add zucchini. Cook until softened (about 5 minutes). Add spinach and stir until wilted. Add bacon and sweet potatoes back in and heat through to combine. Makes 14 servings (¾ cup per serving, around 6 ounces). 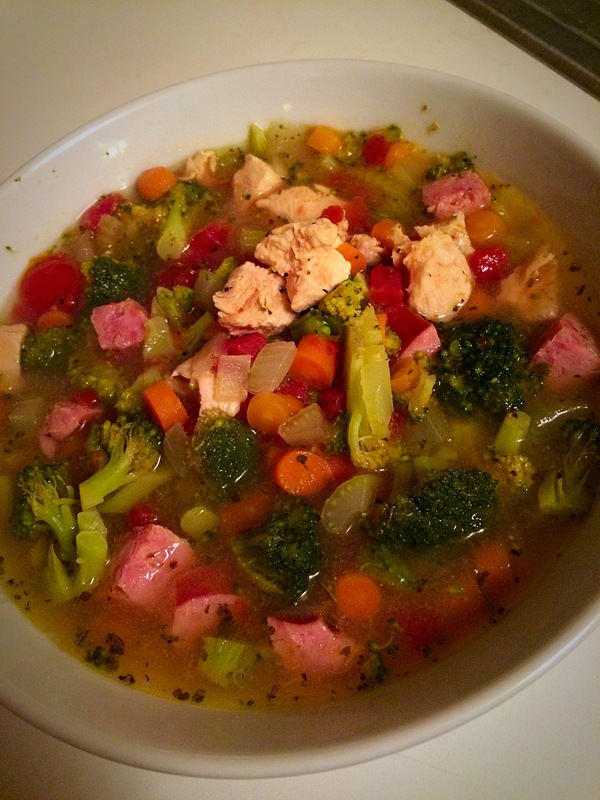 This recipe turned out amazing, and was just what I was looking for! Would be a great side dish for dinners as well as a nice addition to a morning meal. I ended up packing up half of mine and freezing it for next week. I scooping the rest out into pre portioned containers for easy grabs in the morning to bring into the office. The illusive first post… Bahhh!!!! Having some time off work for the holidays, I found myself being drawn into the kitchen rather than the gym. (Ok, ok… I also spent my fair share of time eating and drinking in the kitchen over break as well, but we will get to that later…) My brain was in creative overdrive. I was able to be creative without the constraints of work bogging me down. I knew I needed to get back on track with eating right, and being the healthy caregiver that I am deep down I knew that had to start in the kitchen. No more chicken nuggets for Mini Me or takeout for D (the hubs) and I. Cooking from scratch is something that I love to do, but I usually haven’t just put recipes together on my own. I’ve usually started with someone else’s and adjusted. I suppose that is what most chefs do, right? 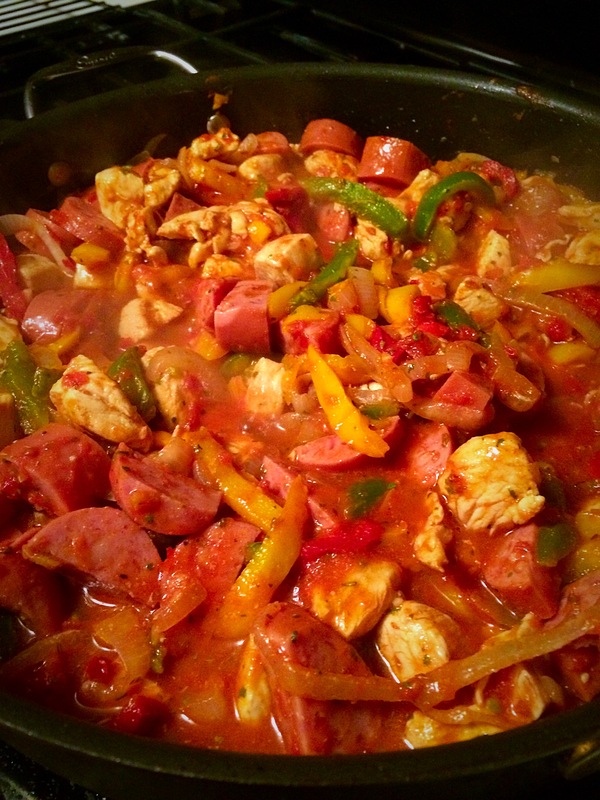 Well, yesterday I made my interpretation of a Jambalaya (no shellfish because of Mini Me’s allergies). After serving it, D says, “This is good. Remember this recipe to make again.” Crap. I was so busy winging it, I failed to record what it was… I’ve never actually turned a meal I made into a recipe before. I was able to piece it together so you can taste it, as well. Hopefully you like it! After prepping all ingredients, heat 1/2T olive oil in a large skillet on medium heat. Add chicken breast to sear on all sides. Remove from pan until later. Add remaining 1/2T olive oil to pan, and add in onions and garlic. Saute until fragrant and onions are becoming translucent. Add the package of frozen peppers (or fresh), and cook until peppers are no longer frozen. While peppers are cooking, mix cumin, paprika, oregano, cilantro, and cayenne pepper to the crushed tomatoes and stir until combined. 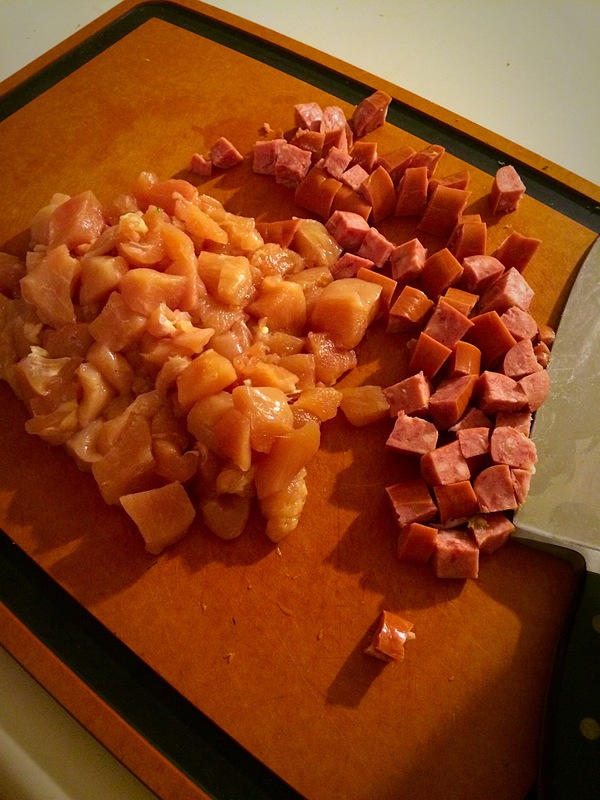 Add chicken back into the skillet, and add sausage. Pour tomato mixture into skillet. Stir to combine. Reduce heat to low and simmer for 20 minutes, stirring occasionally. Serve over rice or quinoa if desired.